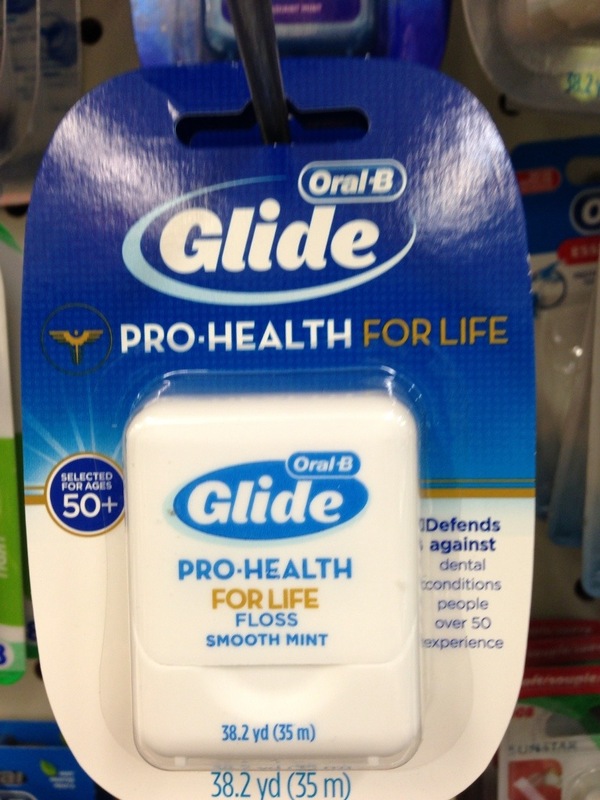 Floss for people over 50?! Really?! Please tell me who thought this was a good idea. Marketing a product that specifically targets an age group sitting snugly on the tail end of the baby boomers. You know us. We hardly see ourselves as grow ups, let alone ones with aging gums. What is the likelihood that you will find us buying old people’s floss? Pro health “for life”. You know, because dead people don’t floss all that much. I won’t be able to read the blog. I will be experiencing dental conditions because I don’t have this floss. This floss is for dentures! As opposed to floss for death? Who flosses in heaven? Doesn’t heaven mean no cavities? is the font bigger so we can read the label without our glasses? Maybe it’s dipped in laxatives, vitamins and anti depressants. They should just dip it in wine! Still surprised that Dr. Jimmy has not weighed in. Is it bad to admit that I saw this while picking up my blood pressure meds?